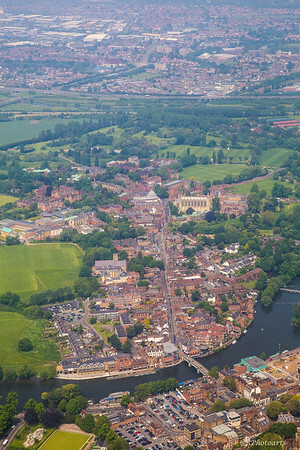 Flying over London, England, this capture shows the suburb of Eton and Windsor joined by Windsor bridge over Thames river. Windsor Castle is just out of the frame on the lower right side and High street leads to historic Eton Collage in the center. Nice aerial shot of this historic park of England! Excellent POV and a great capture!